Welcome to Paradise ! ! ! 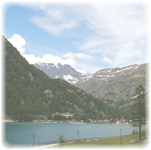 The only camping within the National Park of Gran Paradiso in the Piedmont side. The Camping site “Piccolo Paradiso” is situated in a little corner of Paradise, completely surrounded by a marvellous landscape and represents the ideal place to spend beautiful and peaceful holidays. The Camping “Piccolo Paradiso” offers open space where the silence in only broken by the singing of birds or by the babbling of the stream that flows down the valley. 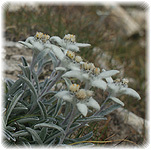 You can admire wonderful mountain summits and view the whole chain of Gran Paradiso, enjoy the fragrance of aromatic plants and flowers that smell as good as perfume, wafting by your tent, even on a gentle breeze. Thanks to its particular position in the vicinity of the Campingit is possible to practise a lot of sports: HIKING, MOUNTAIN-BIKING, WINDSURFING, FREE-CLIMBING, TENNIS, CANOEING, FISHING etc. 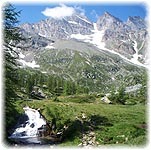 While hiking in this area you will discover interesting specimens of local fauna, such as foxes, marmots, steinbocks and eagles, at the numerous alpine lakes at higher altitude. 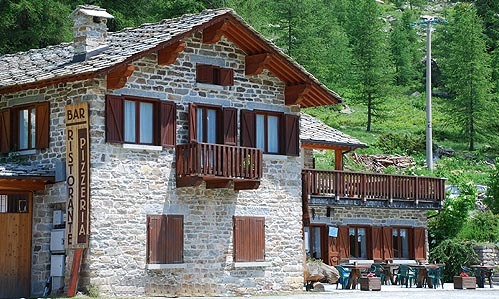 The bar is furnished in typical mountain style with a spacious terrace solarium with deckchairs. A break at the bar will be a nice surprise for you: we serve appetizing sandwiches with local products and liqueurs such as “genepy” or “grolla” for evenings with your friends. With local typical food, pizza and firewood furnace.